LOS ANGELES -- Win streaks, and losing streaks, for that matter, seem to have arcs. They rarely stop abruptly. More often, signs of problems surface before the streak meets its end. That was the case for the Heat, who suffered their first road loss since November to an aggressive and impressive Clippers team, 111-105, on Wednesday night. It snapped a 13-game road winning streak and a nine-game overall run that had lifted the Heat to the best record in the Eastern Conference. Significant credit is due to the Clippers, who were clearly the hungrier team as they continue a midseason surge with their eighth win in their past 11 games. Their athleticism, especially from Blake Griffin and Eric Gordon, and energy often overwhelmed the Heat. But the seeds of this Heat loss were planted earlier on the road trip when they got away with less than standard efforts to eke out overtime wins in Milwaukee and Portland. Add in an unexpected turn -- this time a sprained left ankle for LeBron James -- and the recipe for the end of the streak was right. James turned the ankle on a drive to the hoop in the fourth quarter and spent the rest of the night favoring it. He scored 10 of his 27 points in the fourth, but it may be his last action for a little while. X-rays after the game were negative, but James was unable to put on his shoe and is questionable for the Heat's game Thursday in Denver. For now, the injury is not a real concern, but there are some for the Heat, especially with two upcoming road tests to finish out the trip -- first against the Nuggets, then in Chicago against the Bulls on Saturday. "Sometimes you take it for granted, how tough it is to win in this league on the road," Heat coach Erik Spoelstra said. "We've had a couple remarkable wins down the stretch the last two games but really were outplayed for large part of those games." The Heat trailed nearly the entire 48 minutes Wednesday, but it wasn't a new feeling. They played from behind for large chunks of the past six games, pulling out a couple of impressive but daring second-half comebacks along the way. They were in trouble in recent games against the Rockets, Warriors, Bucks and Trail Blazers before roaring back on their sheer talent and timely defense. That is probably going to be a season-long trait with players like James, Dwyane Wade and Chris Bosh. They'll probably rescue plenty more games, and they nearly did at the Staples Center, as Bosh had 26 points and Wade had an awe-inspiring 31 replete with some striking moves to the hoop. But playing whole quarters of lackluster defense -- as the Heat have been, including giving a 44-point first quarter to the Clippers -- and getting little to no bench help have been extending trends. The non-Big Three managed just 11 total points Sunday in Portland. Wednesday it was just 15, 12 of them coming from Mario Chalmers as he fired up 12 shots to get there. Nowhere in sight was Mike Miller, who continues to wallow on the bench as Spoelstra struggles to find a place for him in the rotation. Nothing here is new, but it finally bit the Heat. Griffin assembled another tremendous game with 24 points and 14 rebounds despite dealing with back spasms. And Gordon led a strong finishing kick with 14 of his 26 points in the second half. Throw in a couple of big Baron Davis baskets -- he had 20 points -- in the final minutes, and the Clippers pulled away. It was hardly a tragic loss. The Clippers are much better than their 13-24 record at the moment, but the game was a reminder that the Heat aren't playing the same basketball that propelled them on their winning streak in December. "We need to take it to heart and not just throw this game away," Spoelstra said. "Understand that there's been a little bit of a sign the last two or three games that this was coming. We don't want to obsess about it ... but there has been some slippage, and we need to take this to heart." The last time the Heat lost on the road, a controversial and demoralizing loss in Dallas back on Nov. 27, there was a players-only meeting afterward. There was no need for any of that this time; the loss could be just a hiccup. But with the upcoming schedule -- the return game to Miami is a matchup with the Hawks -- the Heat might have to hold their breath. "We're a very confident team," Wade said. "It was one of those games; they came out and put their best foot forward. We had won 21 of 22, and now we've won 21 of 23." NEW ORLEANS -- Technically, Monty Williams is in the Orlando Magic record books. And the Magic have some technical issues of their own. The last time Orlando won nine straight games, Williams was playing small forward for them, way back in February of 2001. Now the New Orleans Hornets' head coach, Williams made sure he retained a place in Orlando history, as his Hornets snapped the current-day Magic's nine-game winning streak in a 92-89 overtime thriller. Unbelievably, the Magic, despite six 50-win seasons and a dozen playoff berths, have never had a double-digit win streak in their 22-season history. There are many reasons why they still won't, but the one that will likely stick in their craw is the technical foul called on Dwight Howard with just 2:20 left in a four-point game. The technical was Howard's league-leading 12th of the season -- which doesn't include the three that have been rescinded -- and like many of the techs handed out to Howard this season, it was a borderline call. After a missed shot ended with his arm tucked under Emeka Okafor's, Howard began to run upcourt and swung his arm to shake free of the opposing center. It was a relatively innocuous play, but he was slapped with a tech by referee Steve Javie, who was standing roughly 50 feet away at the time. Two officials much closer to the action declined to call anything. 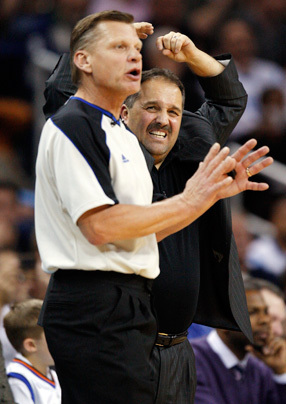 "Steve said he swiped him across the belly," Magic coach Stan Van Gundy said. "Those guys had been tangled up all night. It was an interesting call, let's just say that." "I didn't say a word," Howard said. "[Okafor] was holding me, and I thought you had a right to, if a guy is holding you, to get him off of you and not just let him hold you. I hope the NBA will look at it. "He said I took a swing backwards. But anybody who has played basketball knows if a guy is holding you and you try to run, that's the only way you can get him off. If I wouldn't have done anything, he would have just kept holding me. If it happened again I would do the same thing." Chris Paul made the technical free throw, and that single point looms large in a game that eventually went to overtime. While we can't say for sure Orlando would have won -- the Magic were shooting 3s to tie at the end of regulation and might have approached things differently, plus New Orleans' last-minute execution was terrible -- we can certainly say it hurt. Zach Harper, TrueHoop Network bloggers and fans gave their in-game opinions throughout Wednesday's slate of NBA games in Daily Dime Live. Baron Davis, Clippers: This one showed some flashes of vintage Boom Dizzle. A sweet dunk even! Playing his third straight solid game, BD had 20 points and nine assists and set the tone for the Clips in their win over LBJ & Co.
Dirk-less Dallas: Playing the Sasha Pavlovic card did not do the trick. The Mavs dropped to 2-6 without Dirk Nowitzki, taking a 102-89 loss to Indiana. Rick Carlisle refused to field Dirk questions afterward. "It wasn't even a comment from me, it was someone who sent it to me and I sent it out. It wasn't toward that team. It definitely wasn't a good showing by that team [Tuesday] night, I know they wish they would've played better." -- LeBron James, distancing himself from his "karma" tweet. The discussions surrounding the three-team trade that would send Carmelo Anthony to the New Jersey Nets have become more a battle of wills than a contest of competing offers. Whether Anthony winds up with the New York Knicks or Nets will be largely determined, it appears, by who is willing to settle for less than their dream outcome. The latest act of misdirection comes from the Nuggets, who are threatening to deal Anthony in a direct deal with the Knicks if the Nets don't stop leaking information about their proposed deal that would also include the Detroit Pistons. (As an aside, does anybody find it amusing that the Nuggets would leak that they're unhappy with the Nets for leaking information?) Denver's threat is hollow, sources say, for two reasons: One, because Stan Kroenke, the Nuggets' former owner who ceded control to son Josh, is vehemently against dealing with the Knicks after being embarrassed at Anthony's wedding in Manhattan by talk of his star becoming a Knick; and, two, because the Knicks can't offer the Nuggets anywhere close to the same package of building blocks -- young talent and multiple first-round picks -- that the Nets can. Magic coach Stan Van Gundy made his feelings known to Steve Javie during the Magic's loss in New Orleans. BOSTON -- Semih Erden was toast, the thought of chasing his defender off one more pick-and-roll simply too daunting, so he hedged the ball-handler a little more emphatically than necessary, picking up his sixth foul and ending his night 60 seconds before the Boston Celtics sealed a 119-95 triumph over the Sacramento Kings. Erden, who had played a mere 11 minutes, 47 seconds since Christmas, logging eight DNP's during that span, posted a whopping 33:29 on Wednesday, filling a frontcourt void as center Jermaine O'Neal sat out with swelling in his troublesome left knee. What's more, Erden matched one career high with 10 points and established another with eight rebounds. "He ran out of gas, there's no doubt about that," Celtics coach Doc Rivers said with a smile. "That was a foul of convenience, that sixth foul, because I think he thought his lungs were going to burst, so he was trying to get out of the game. Steve Nash made all 11 of his free throws in the Suns' overtime win against the Nets to pass Mark Price as the NBA's all-time leader in free-throw percentage (based on a minimum of 1,200 free throws made). Nash's career percentage stands at .9040 (2,711-for-2,999), compared to Price's .9039 mark (2,135-for-2,362). Nash eclipsed Price by making his past 48 free throws, the longest streak in the NBA this season and the longest for Nash since he made 54 consecutive shots from the line in 2008-09 (Dec. 4-Jan. 21).